In 1987 the US Navy bought 26 F-16N for use as adversaries in Dissimilar Air Combat Training (DACT). The F-16N is basically a stripped down F-16C, lacking the cannon and any defensive electronics and fitted with the GE F110 engine. 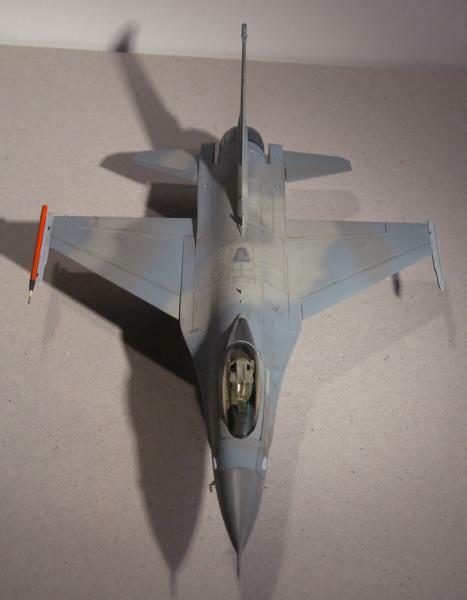 The F-16N was highly successful in its Adversary role, but problems with wing attachment fatigue due to heavy use and the costs of spare parts meant that by 1995 all F-16N were either placed in storage or sold. 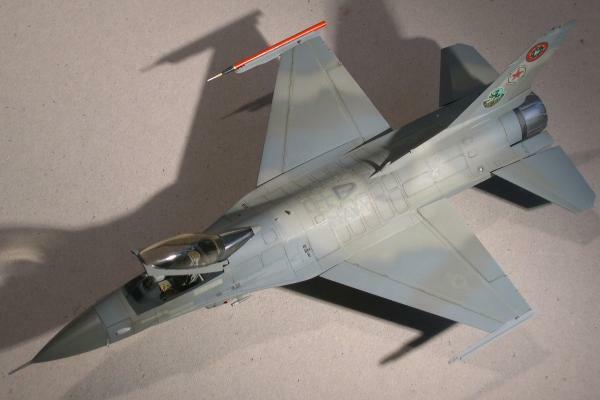 There are two kits of the F-16N available at 1/72nd scale, one made by Fujimi (cat. nr. E-6), the other by Hasegawa (cat. nr. 718). I had both kits, the Fujimi kit contains parts for doing either a single- or a dual-seater and comes with a very comprehensive decal sheet, but the shape of the fuselage and canopies looked a bit suspect to me. The Hasegawa F-16N kit is basically the same kit as the F-16A Plus and F-16C kits and contains decals for two aircraft, one NFWS aircraft, the other in the Initial Delivery Ceremony livery. I was already familiar with the strengths and weaknesses of the Hasegawa F-16 kits so I decided to build the Hasegawa kit and ended up selling the Fujimi kit. Hasegawa tells you to fit the tub to the lower fuselage half but this will result in some visible gaps between the tub and panels and the upper fuselage half. I prefer to attach the tub to the upper half, however this will result in the seat hitting the canopy. 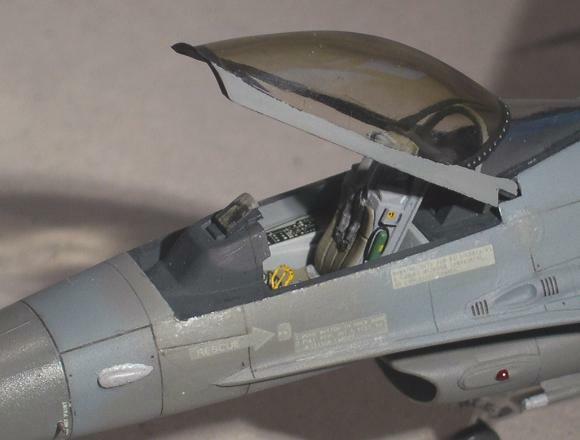 Fortunately all Hasegawa F-16 kits, apart from the F-16A Plus, also contain a slightly shorter rear seat (part C23) which fits perfectly and once fitted you can't tell it is shorter. Before fixing this bulkhead in place I temporarily attached the main landing gear legs (parts C7 and C8) with white (PVA) glue so I could verify alignment by measuring the distances between the wheel axles and the wing attachment points. After the bulkhead is firmly fixed I removed the landing gear again. I cut two pieces of flexible PVC tube (power cord insulator) and fitted those behind the holes for the horizontal stabilizers to act as receptors for the pivots, similar to the soft plastic bushes used for fitting model car wheels. This way the horizontal stabilizers remained adjustable and could be left off until painting was complete. When joining the fuselage halves, I did not apply glue to the edges of the speed brakes, this resulted in a slight gap, just like the real ones that are often slightly ajar when the aircraft is powered down. The fuselage parts of the trunk (parts B14 and B15) didn't fit too well, so I fitted these to the lower fuselage first, made them fit flush with the lower fuselage, filled any gaps and then inserted the nose wheel bay and the intake trunk. I preferred to wait with attaching the engine exhaust nozzle assembly until after painting, so I could insert an old toothbrush in the hollow rear fuselage which makes a great handhold while painting and decalling the model. Note that the angle for the belly fins (parts C17 and C18) is 15 degrees outboard off vertical. I drilled a hole through the canopy actuator (part B13) and through the sides of the canopy frame and fitted a metal pin, sanding the ends of the pin flush with the canopy frame. This way the actuator can be rotated upward if you want the canopy closed and downward to display the canopy raised. I made a replacement pitot tube from a cloth pin and built up the wider area by repeatedly dipping the rear of the pin in white (PVA) glue. I attached the pin firmly to the nose cone with super glue. 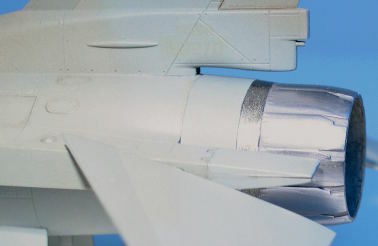 the pointy tips of two more cloth pins were used to replace the AOA probes on both sides of the radome. I cut up a spare AIM-9 Sidewinder and turned it into a TACTS (ACMI) pod, the probe on the TACTS pod was again made from a cloth pin. 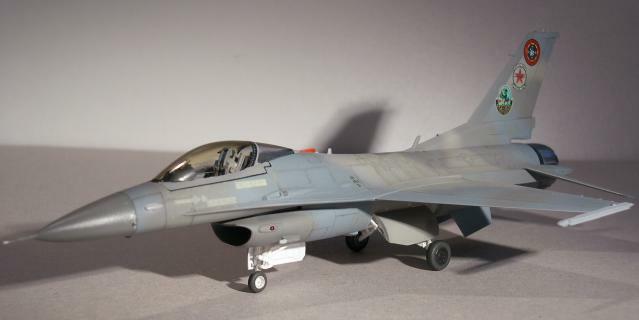 Nowadays you can find a nice ACMI pod in various weapon sets, such as Hasegawa X72-009 "Aircraft weapons V: US Missiles and launchers", but back when I built this F-16N model, these sets were not yet available. I added covers over the rear fuselage lights from thin clear plastic foil (cut from the window of an envelope, a small circle of clear decal sheet should also work). 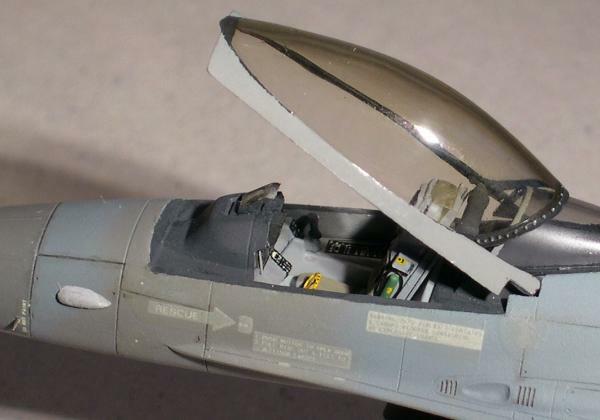 In fact the seat turned out so nice that I fitted it to the tub with white (PVA) glue so I can remove it and fit it into another F-16 kit later (in case I finish an F-16 model that turns out better than this one). I decided to use the kit decals for the Initial Delivery Ceremony, I later read that the aircraft painted for this ceremony was actually a repainted Air Force F-16C fitted with an F100 engine, so my models F110 engine exhaust nozzle is the wrong type for this paint scheme, oh well... 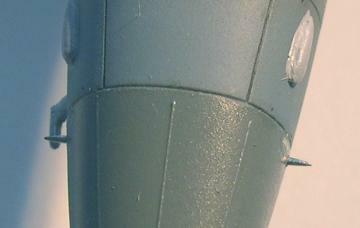 The kit does contain an optional F100 nozzle so I can correct this later. I masked the cockpit area and intake and temporarily glued the wheel bay doors shut with white (PVA) glue. Then I sprayed the camo scheme using some trusty old Humbrol Authentic Colour paint. Note that the fuselage sides from the flaperon hinge line to the speed brake hinge line are finished in FS.36231 chafe resistant paint. After spraying the camo scheme, I sprayed the entire model with Talens Rembrandt Acrylic Gloss Varnish Nr. 3 and applied the decals. When applying the decals I put drops of the same Talens varnish under each decal to help them seat and to prevent silvering. This usually works like a mild version of the various decal setting solutions, but unfortunately this time some decals started wrinkling a bit when I sprayed on the acrylic flat coat. The end result was a nice flat finish with some silvering visible around the walkway lines and 'NAVY' decals. The exhaust nozzle was painted with Humbrol Metal Cote 'Polished Steel', I buffed the petals but left the recesses untouched. Date finished: August 30, 1992. 'Bandits !, Pictorial History of American Adversarial Aircraft', Dave Parsons and Derek Nelson, Motorbooks International, ISBN 0-87938-623-1 . 'Lock On nr.2, Gen.Dyn. F-16 Fighting Falcon', Verlinden Publications, ISBN 90-70932-03-2 . ... and I wish I had this book at the time I was building this model, it's the ultimate F-16 reference: 'Uncovering the Lockheed Martin F-16A/B/C/D', Danny Coremans and Nico DeBoeck, DACO publications, ISBN 90-806747-1-0 . Report on flying the F-16N at Topgun, with some great pictures.